The Anniversary Update adds a nice little feature that makes it easy to hide your email address on Windows 10's sign-in screen. We’re just weeks away from the Anniversary Update for Windows 10, which includes all kinds of new features. But along with all the big stuff like better inking and a beefed up Cortana, there are also small touches that many people will appreciate. Today we’re going to look at a new nice touch that controls what kind of information you display on the sign-in screen, specifically your email address. Right now, when you land on the login screen on a Windows 10 PC it displays your name and the email address associated with your Microsoft account. When you’re at home that’s no big deal, but you may not want that information displayed where someone might sneak a peek, such as at a coffee shop or in a business meeting. In my tests with the latest Insider builds this information was taken off the login screen by default. It’s not clear if the same will be true for people upgrading from a previous version of the operating system. Regardless, accessing the setting is pretty easy if you end up needing to hide this data or, conversely, want to to display it again. 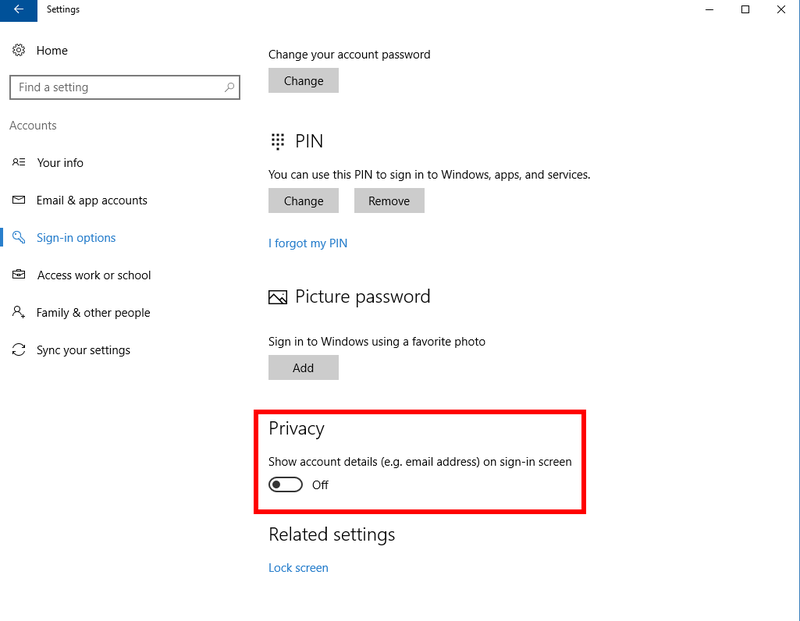 A one-click setting makes it easy to hide your email address. 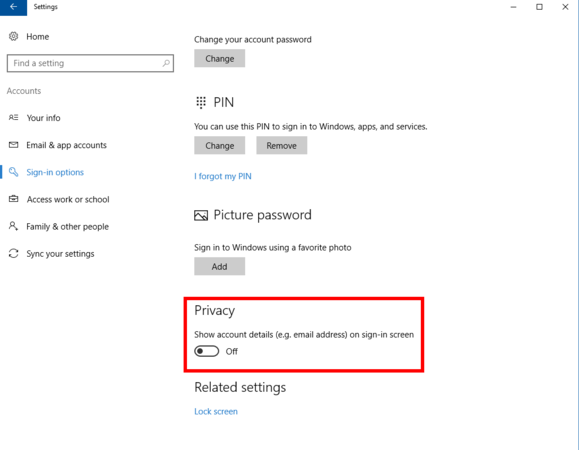 In my tests with build 14388, you go to Start > Settings > Accounts > Sign-in options. There, under the Privacy subheading, you’ll have one slider labeled Show account details (e.g. email address) on sign-in screen. Flip that on or off depending on your needs, and that’s it. This new feature has been around for months so presumably it will remain once the official Anniversary Update rolls out. If it doesn't we’ll adjust this article accordingly.